Samantha: "There are five classes in third grade. Each class has nine students. How many students are in third grade?" Narrator: "You can figure this out by multiplying nine times five which is easy if you know your times tables, but not all of these third graders know their times tables yet. But they have other ways to solve this problem. Samantha uses skip counting"
Samantha: "Nine, eighteen, twenty seven, thirty six, forty five." The teacher then asks for another way, "... any other strategy?" One kid suggests using a number line "You could count nine five times on a number line..."
On another NPR broadcast I heard about addition, apparently now being done from left to right when adding two numbers together... (note: other than stating that was how it was being done they didn't go into specifics). 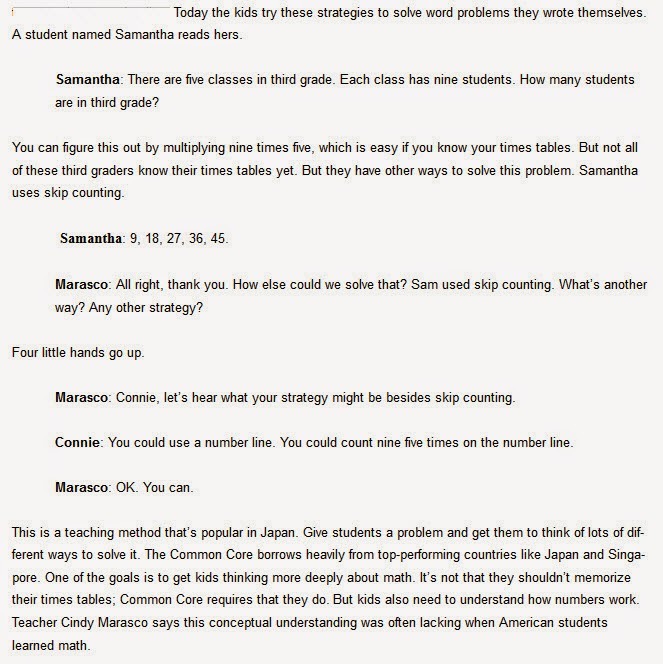 OK... Once again this blogger doesn't really know much about the subject, so silliness like this might well have been part of the pre-common core teaching of math. It is clear however that people feel very strongly about this; that all concerned are clearly talking past one another; and that the situation hasn't been helped in the least by the politicians who have jumped into the discussion (usually dragging in other issues and biases). 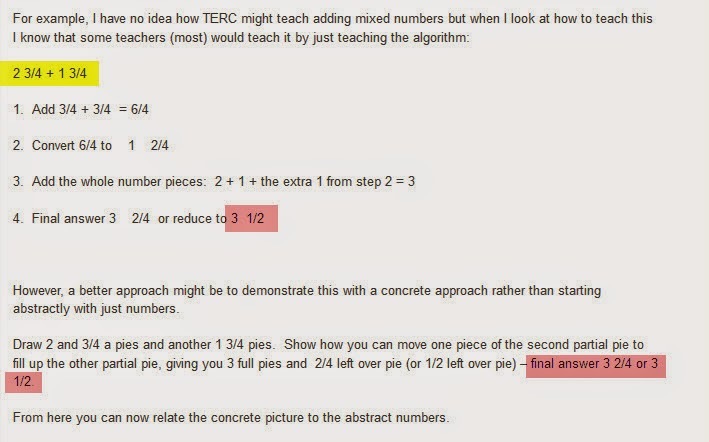 Hopefully we can at least all agree, using either common core techniques or the old-fashioned method, that 2 3/4 plus 1 3/4 gives us 4 1/2. Apparently this is not clear to someone with a Ph.D in Mathematics Education. Ouch!